1. Singleton still a standout. 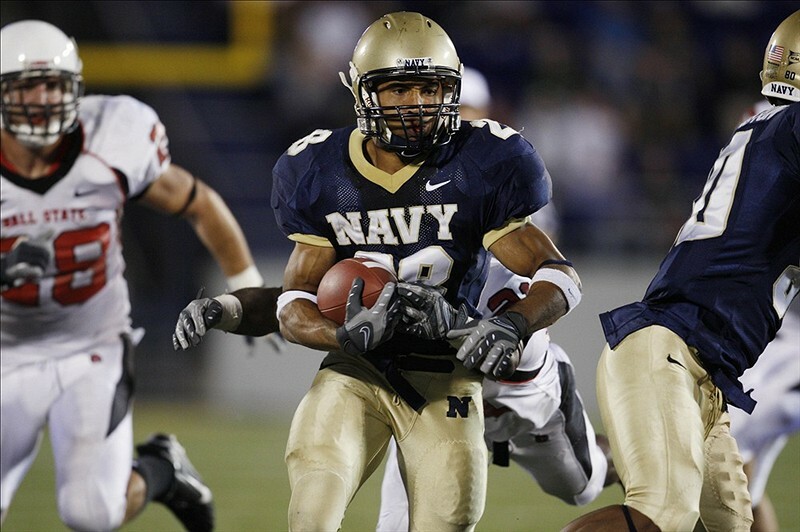 As part of a 2007 Navy offense that included Eric Kettani, Shun White and Tyree Barnes, slotback Zerbin Singleton managed 484 yards rushing and a team-high 263 yards receiving. Those numbers may earn him a spot in the Navy’s media guide, but not in the annals of military history. Don’t worry — he’s got that covered. 2. Steele’s MWC take. We told you about Phil Steele’s All-Independent preseason honors, so it’s only fair we highlight the Air Force representatives on his All-Mountain West Conference list. Linebacker Alex Means and kicker Parker Herrington made the first team, with offensive tackle Jason Kons earning second-team berths. The trio of seniors will lead Air Force into its season-opener against Idaho State on Sept. 1. 3. Closest to “cupcake”? Bruce Feldman, the senior college football columnist at CBSSports.com, ranked Notre Dame’s schedule as the toughest in college football, as it combines top-tier programs such as Oklahoma, Miami and Michigan with a lack of Football Championship Subdivision pushovers — “cupcakes,” as Feldman calls them. That schedule begins Sept. 1 in Dublin against Navy — a team Feldman ranks among the closest-to-cupcake portion of the Irish’s schedule, along with Purdue, Wake Forest and Boston College. Not exactly the highest of praise, but not bad company — not exactly Idaho State, at least. Speaking of Air Force, Feldman has kind words for the Falcons, who’ll be No. 2 on the schedule for Michigan after the Wolverines open the season against Alabama. Having to recover from the Crimson Tide and deal with the Falcons’ option attack could prove challenging for the Wolverines, says Feldman, who ranks Michigan’s schedule as fourth-toughest.